Do you think you have what it takes to work at one of Wales' top wedding venues and dog friendly accommodation venue? We are always looking for talented and enthusiastic staff to work at the Castle, please take a moment to browse positions at the Castle and please send a prospective CV and covering letter through our online application form. Some positions may not be currently available however please do send us a CV so that we can add it to our talent pool and we will get in touch when a position arises. Our wedding planners are exceptionally skilled and adept at all aspects of wedding planning. 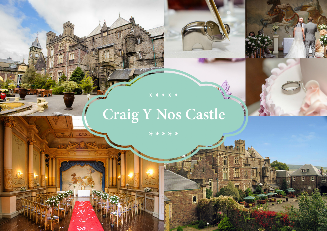 Craig Y Nos Castle is always looking for someone who may be up to the challenge and who has had previous experience in planning every aspect of a bride and groom's perfect day. This ranges from making initial appointments through to the service and aftercare. If you have previous experience as a wedding planner or as an assistant we would love to hear from you. Craig Y Nos Castle is looking for someone to keep an eye on our finances and a track of our income and expenditure. You will need to be fully conversant with the role of a day to day book keeper. We are looking for a Front of House Manager at Craig Y Nos Castle to assist with all aspects of our Hotels Bed & Breakfast and Evening Meal Functions. You will be managing a team of waitresses in a breakfast and evening meal shift pattern, and will include setting up, preparation and laying down of tables for service. Our receptionists encompass some of the most varied work at the Castle and no two days are ever the same. Dealing with customers and a wide variety of aspects you will need to be organised and have a great skillset in customer service. You will be required to clean bedrooms and function rooms working mornings till 2pm and evenings on a split shift system. Must be punctual and able to work quickly and methodically. To wait on tables either for evening meals or at wedding events. The Castle is fast paced and you will be working eveings and/or afternoons. Alongside our team of friendly staff upwards of 120 guests attending a wedding. You will be able to converse with our guests and to make them feel as part of the family. Good Quality staff to join our team able to serve alcohol, cocktails and soft drinks using an electronic till and operate a credit card machine. You will be often working weekends at busy weddings finishing late. The ability to deal with customers and engage in friendly conversation. You may also be required clean lines/deal with stock and orders. All of the above are positions that we commonly need staff for, if you send your CV through to us we will add you to our talent pool and will be in touch when a position arises.